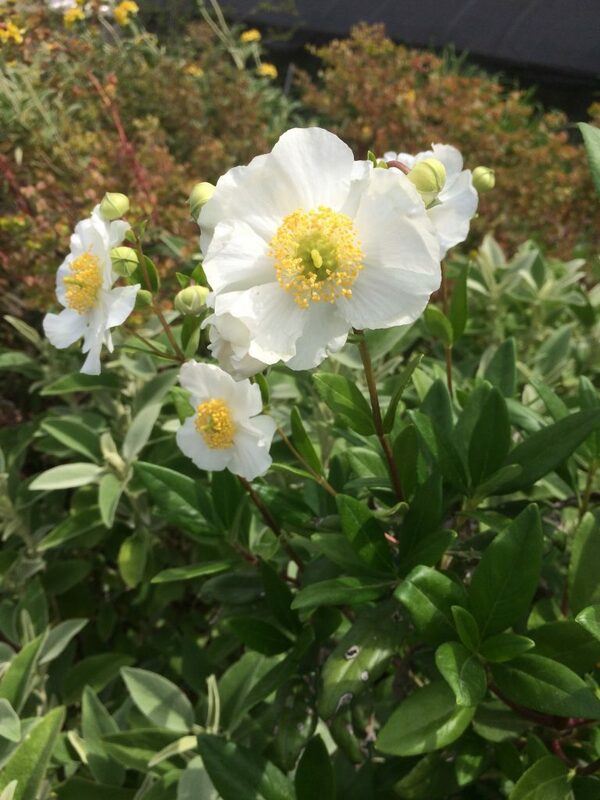 Bush Anemone is a locally rare native of the Sierra Nevada foothills in Fresno County in central California. This tough evergreen shrub with thin deep green leaves set against pale exfoliating glossy bark is perfectly hardy to cold and drought. 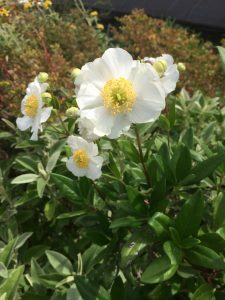 In May/June 3″ wide pure white flowers with a central yellow boss of stamens are sweetly fragrant. Full sun to almost full shade in any soil with adequate drainage. Adaptable to dry clay soils and able to endure extreme drought. High deer resistance. Extraordinarily climate adapted- enduring summer drought and winter rain. Appreciates good air circulation. No crowding. To 8′ tall and 5′ wide in 6 years. Often left alone by deer- but they will definitely try newly installed plants. One of our most treasured west coast native shrubs. Very long lived sited correctly and denied summer water. Accepts blasting reflected heat. In time you can limb up the shrub to reveal the white/taupe exfoliating bark which appears glossy with age- this also assists in the air flow that this shrub craves. A monotypic genus. There’s just one species.